Do you know someone who is struggling in school? Could it be a vision problem? How is vision and learning related? For any one who works with children, this is a very informational journal article written by a Canadian colleague: Dr. Charles Boulet. Piquette N, Boulet C. Visual Impediments to Learning. 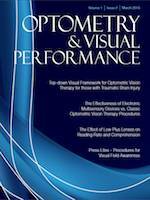 Optometry Visual Performance 2013; 1(4):202-222.